We’re sure you’re here because you would like to get your first trampoline, or a better trampoline than your previous one. 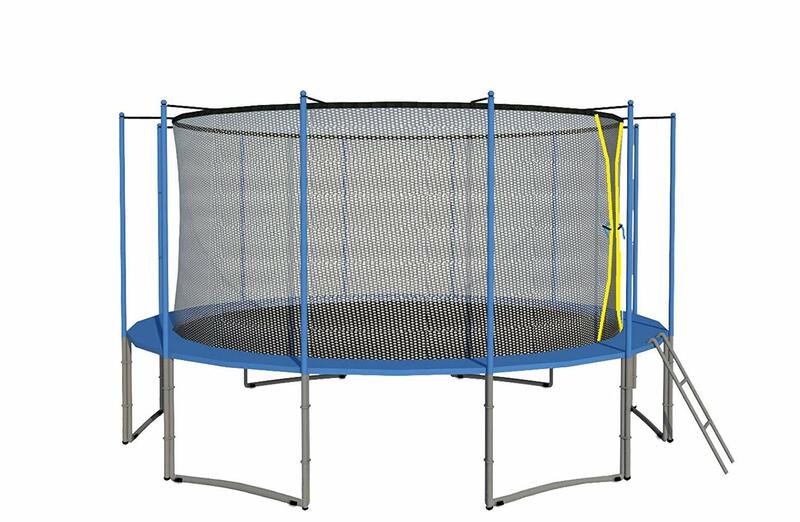 However, one quick check online revealed that there are many different types of trampolines. Round, square, rectangular, oval, octagonal…why are there so many trampoline shapes? What are their differences? Is there a best trampoline shape to suit your needs in every way? Find out in our article of trampoline reviews! 1 The Best Trampoline Shape – Is There One? The Best Trampoline Shape – Is There One? 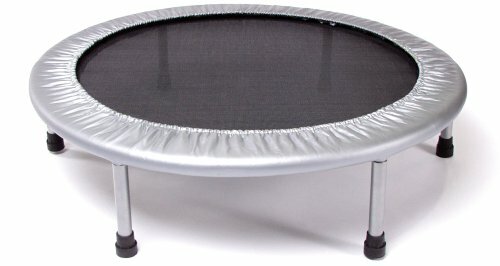 There are actually no ‘best’ trampoline shape. Though trampoline shapes are quite a personal choice, there are subtle differences that the shape brings to the jumping experience. Round trampolines are one of the most common trampoline shapes out there. As they’re usually more affordable and lighter than other shapes, round trampolines are very popular for home use. These trampolines are most bouncy near the center and jumpers are usually steered to remain in the center of the jumping pad for the best jumping experience. Octagonal and oval trampolines are hybrids of the round trampoline. They tend to be a tad bigger and provide more bouncing surface than their round counterparts. There aren’t too many options for oval and octagonal trampolines in the market, which can be the reason why they’re usually more costly than the best round trampolines. Rectangular trampolines are usually the standard shape for trampolines used in gymnastics competitions and training. That’s because they offer a generous jumping area with the most even bounce over the entire surface. The best rectangular trampolines tend to offer the best bounce heights as well, which is essential for executing fancy somersaults, flips and moves in midair. Due to their bigger sizes, rectangle trampolines are heavier than trampolines of other shapes and their prices tend to veer on the high side. Square trampolines are actually smaller versions of the rectangle trampoline. They’ve a more solid bounce (that means less overall jumping height) and more lift. This is the shape that many kids trampolines and the best adult fitness trampolines come in. Yes, you’ve read it correctly. Spring-free trampolines. Besides the conventional spring-based trampolines, spring-free ones are the second type of trampolines most commonly available in the market. As the name implies, these are trampolines without the usual springs. Flexible rods are used instead of springs. Coiled springs and their tubular frames cause 90% of all trampoline-related injuries. By getting rid of the springs, the risk of falling through or getting trapped in their gaps disappears, making it safer for young jumpers. The frame and the flexible rods of the best spring-free trampolines are hidden underneath the jumping pad. This makes the possibility of accidentally hitting them and getting hurt really low. The soft edges of the mat is great at absorbing shock, another feature that makes spring-free trampolines safe for kids. Elastic bands are used to hold the trampoline mat to its frame. This gives a higher bounce and more fun. These are conventional or traditional trampolines whose jumping pad is attached to its frame using springs. There are safety pads with fantastic shock absorbing ability on the spring-based trampolines that protect users from accidentally hitting the frame and hurting themselves. The springs can be easily removed and replaceable if they wear out. Before we get to the trampoline reviews, here’s a helpful list of things to consider when looking for the best trampoline to buy for the whole family. Trampoline exercise is one of the most entertaining and affordable ways to work off that heavy dinner, strengthen muscles and joints and work towards better flexibility. If your trampoline is intended for fitness purposes, it’s practical to choose one that’s designed for exercising. Fitness trampolines usually come with bars and electronic devices that track of the number of bounces or calories burnt, letting you get more out of your jumping exercise. If the trampoline is meant for your kids, it’s good to pick one that comes with a safety enclosure or net as that will prevent them from bouncing off the jumping surface. 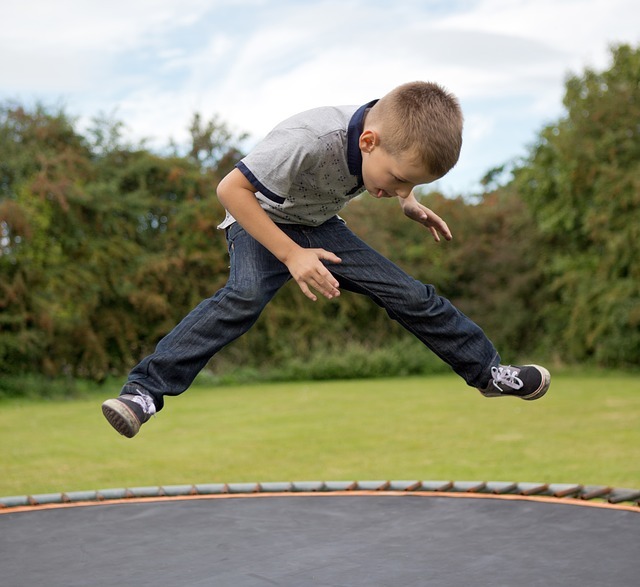 If adults will be using the trampoline most of the time, it’d be wise to choose something with a lower rebound surface so that the impact of all that jumping on bones and joints will be minimized. Having too many happy people jumping on a trampoline not designed to sustain that kind of weight is highly dangerous. Trampoline malfunctions, falls and accidents could happen in an instant and catch everyone unawares. Always choose the best trampoline with a maximum weight range that is well beyond the weight of the person who will be using it most frequently. Safety should be top priority for every parent shopping for the best trampolines. Trampoline safety has improved by leaps and bounds since the era of “free and easy” trampolines without any safety enclosure. Most decent trampolines nowadays come with safety enclosures or nets that stop children from bouncing off the trampoline when playing on it. These are thick pads placed around the trampoline to protect you or your kids from hitting the springs. Trampoline pads are usually made from thick, durable materials. The more sophisticated ones can be UV-coated and frost resistant to offer more protection from the elements. These are great for easily pulling the springs into place when you’re installing your trampoline. Best trampolines come equipped with spring pulling tools while others do not. If a spring pulling tool isn’t included in your trampoline, it’s pretty affordable to buy one. The best trampolines come with trampoline ladders which can be very helpful for letting kids get off and on safely. However, do watch out for very young kids who may clamor onto the trampoline using the ladder before they’re ready for such a rigorous activity. If your trampoline is placed outdoors, it’s good to secure it with a trampoline anchor to prevent it from being blown away by strong wind, especially if you live in a windy area. Moreover, the best trampoline anchors can make it tougher to steal and get away with your trampoline, giving you more peace of mind for leaving it outdoors. Let’s face it. The best trampoline can sometimes be a substantial investment. A little protection goes a long way to sustaining the longevity of your investment, especially if your trampoline is placed outdoors. A trampoline cover is an affordable way to protect your trampoline from the elements, dust and dirt like bird droppings. In the age of kick-scooters and computer games, it seems that trampolining is an entertainment in a class of its own. Frankly, there are lots of health benefits (besides the immense fun) with this jumping activity. Trampolines and rebounders are some of the easiest ways to crank up your muscle strength and fitness level. All that jumping brings on an accelerated heart rate which increases oxygen circulation around the body, making you more alert and giving you those much-envied rosy cheeks. If you’re new to trampolining or had a heart attack or a history of serious illnesses, always consult your doctor before taking to the trampoline. With all that bouncing on the trampoline, you may have thought that trampolining is a high impact exercise. In fact, it isn’t. Trampolining is actually lower in impact than popular sports like jogging or tennis. Which makes trampolining the ideal exercise for older folks and young kids whose bones and joints are more fragile.But what makes jumping on a trampoline a low-impact sport? That’s because the trampoline pad absorbs 80% of the impact while hard surface like treadmills, roads and tennis courts don’t. This means you can give your muscles a good workout while protecting your joints with trampolining. Jumping up and down on the trampoline under repeated mild stress actually helps build up your musculoskeletal system and increases the mineral content in bones. The mild landings help you develop strength over time, reducing the occurrence of brittle bones or osteoporosis. 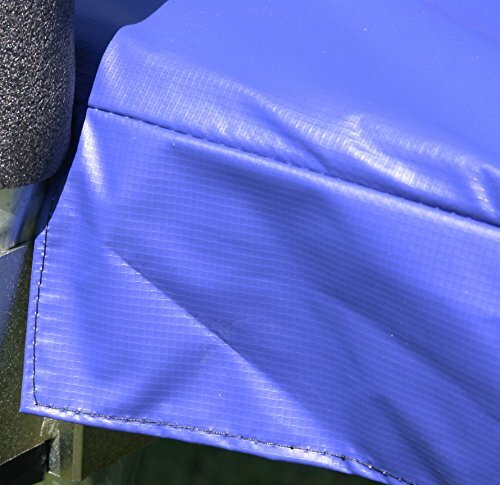 The trampoline pad absorbs most of the impact, protecting your bones while strengthening them. Besides pumping oxygen more efficiently throughout the body and shedding off what’s unwanted, the pure joy of leaping through the air literally uplifts your spirits. Moreover, upon mastering some fancy moves, your confidence will soar with every leap as well. Besides, we seldom trampoline alone. There will definitely be cheerleaders at the side. The great company, fresh air and the sheer freedom of catapulting through the air…frankly, it’s tough to feel blue like this, isn’t it? Whether you consciously know it or not, you’re multi-tasking when you’re on the trampoline. All that balancing, maintaining body position and bouncing at the same time requires you to focus and hones bilateral motor skills while developing different muscles to control your limbs and movement. Trampoline exercise increases metabolic rate and helps your body digest and process food more efficiently, thereby keeping a healthy weight. All you need is a little space for your trampoline in the house or in the backyard. No need to rush to make it to the gym before it closes, plan a route for your run or book a court for a game of tennis. You don’t even need to spend money on getting the right attire to ‘fit in’ with the stylish fitness crowd. With trampoline exercise, you can get on the trampoline anytime in your most comfortable clothes and have a great time within the privacy of your house or backyard (unless you bounce high enough over the fence for your neighbors to spot you). Now that you’ve a clearer idea of the benefits of trampolining and what to look out for in the best trampolines, take a look at the reviews of some of the most popular trampolines currently in the market. We’ve categorized our trampoline reviews according to price so that you can zoom in to those that fit your budget straight away. First up in our trampoline reviews are those that won’t break the bank. These are the best trampolines to buy for a first trampoline or if you’re running on a tight budget. Exercising can really be this nifty with the Stamina 36-Inch Folding Trampoline. Having a unique structure that lets you effortlessly fold down to a smaller size for easy storage and transportation, you can conveniently tuck the trampoline away in a closet or under the bed when you’re done with exercising. Putting the trampoline into your car boot and bringing it wherever you want is equally easy as well! No more excuses for not keeping to your exercise routine even if you’re in another city. You don’t even need to take out expensive gym memberships to get fit. And you can rebound anytime, anywhere – even when you’re watching TV! Though many people love the Stamina 36 inch Folding Trampoline for its unique flexibility, there are some gripes about it. Some people complain that the silver cover is rather tough to stretch onto the trampoline frame while others feel that it’s not as bouncy anymore only after a few weeks of use. 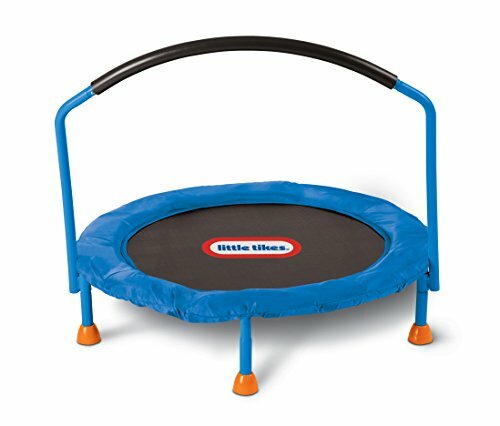 Your kiddos will love the Little Tikes 3′ Trampoline. Created to let your little ones get some fun and safe exercise under your watchful eyes indoors, they can develop better balance, fitness and co-ordination while working off excess energy to be able to sleep better at night. However, some people give this trampoline the thumbs-down as it’s tough to assemble it. Some parents also mentioned that the trampoline tips when their kid jumps on it, so it may not be the safest toy for every child. Put away those mobile devices, log off the computer and get outside for some bouncing fun! The best trampoline to get your kids away from sedantary technology and work up some sweat, this Best Choice Products 55″ Round Kids Mini Trampoline is great, healthy fun. Sporting a no-spring design, this trampoline has a springless bungee that lies beneath the jumping surface. 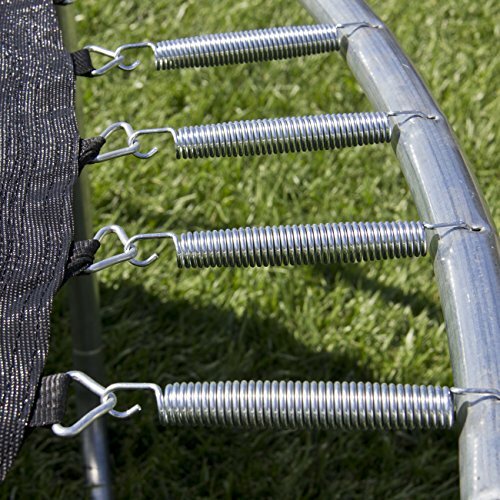 This eliminates conventional metal coil springs that could trap little toes and fingers, making it safer for your kids to have fun while giving you more peace of mind. After all, safety should be the norm rather than an option when it comes to trampolining. This trampoline boasts other safety features too. It’s engineered from rust-resistant steel to provide many years of stable bouncing fun and has a foam-filled waterproof pad to cushion awkward landings. Its safety enclosure is made from durable mesh fabric to prevent accidental landings outside the jumping surface, making this mini trampoline the best trampoline for active kids. According to several people who have bought this trampoline, the safety net enclosure and poles that hold it are rather flimsy. The terrible instructions for assembly don’t go down well for some buyers as well. If you have a generous budget and don’t mind spending a little more, check out these quality trampolines. Who knows, the best trampoline for the kiddos could be one of these! This could be the perfect backyard trampoline you’ve been searching for. At 14 ft, the bigger jumping surface means more bouncing fun and less risk of falling off for your kids. 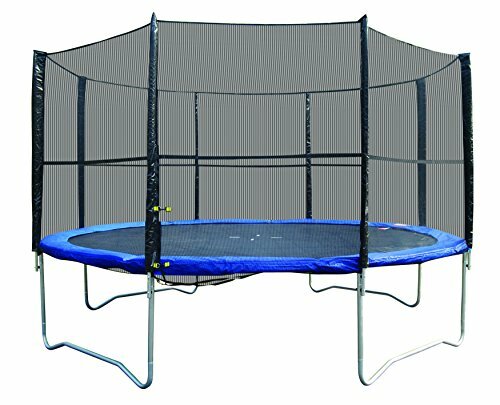 The best trampoline to buy for older kids who want to experiment with tumbling and more sophisticated jumps, this Super Jumper Combo Trampoline has sturdy galvanized w-frames to offer more stability. Its trampoline mat and safety pad are also UV coated so they can last for many years outdoors. 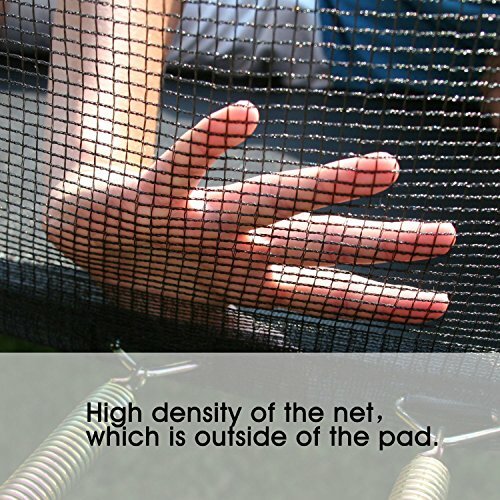 The safety net enclosure is one of the most important features for trampolines. You can rest assured that the safety enclosure for the Super Jumper Combo Trampoline is made of finely-weaved mesh material which is not susceptible to tears and tiny fingers and toes will not accidentally get trapped. The safety net also features an easy open/close zipper door for your little ones to safely get in and out of the trampoline. Many people are very happy with their purchase. However, there’s some negative feedback as well. Some people discover that the safety net support structure couldn’t stay straight after a few hard landing contacts with the safety net. The steel legs are also warped in a few places only after a few weeks of use. There’s lot of jumping room on this 15 ft Skywalker Trampoline. And it’s top-notch on safety features too. The Skywalker Trampolines enclosure net uses an innovative patented design that attaches to the jumping mat and not the trampoline frame. This gets rid of gaps between the jumping surface and net enclosure, making it safer for every jumper. The trampoline frame is made from heavy-duty and weather-resistant galvanized steel with T-sockets at every joint. This creates a sturdy and safe frame that can withstand the elements for many years of bouncing fun. Moreover, all materials are waterproof and UV-coated for added protection outdoors. While this 15 ft Skywalker Trampoline has many advantages, it’s not without its downsides. Some people said that the springs are already ripping out after only 2 months of use and the safety net poles gave way only after 18 months of use. This ExacMe 16 ft trampoline could be your best trampoline for safe family fun. Having 6 W-shaped legs with 12 contacts points with the ground, this makes for greater stability than trampolines with only 4W or 5W legs. Its rust-resistant galvanized trampoline frame also makes for many years of safe jumping exhilaration for your kiddos. In fact, every other component of the ExacMe 16 ft trampoline is created with safety in mind. The safety net enclosure is made of weather-resistant mesh and the poles are covered with thick, waterproof padding to protect you and your family from accidental hard landings. The mini ladder that comes with the trampoline lets young kids get up and off the trampoline safely and is securely hooked over the trampoline frame under the safety pads. The thoughtful design and solid structure are what assure and please many buyers who gave the ExacMe 16 ft trampoline many thumbs-up. Great price, sturdy trampoline, but a tad difficult to assemble. That’s the general consensus among people who have bought this backyard trampoline. Though having a great price, some people are disappointed that the jumping mat and springs gave way only after 2 months of use. Look forward to top-notch quality with this top-end trampoline. 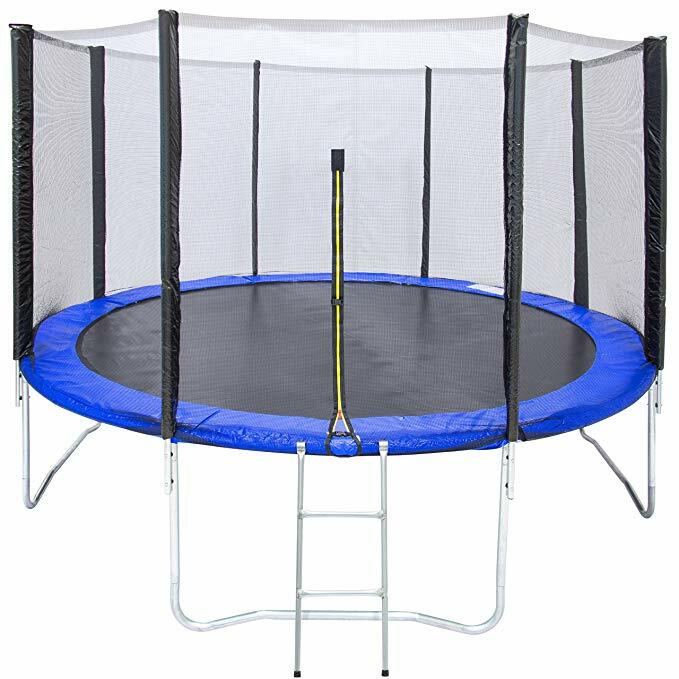 The 15 ft Skywalker Rectangle Trampoline with enclosure is a classic rectangle shaped trampoline that’s often the standard shape used in gymnastics competitions and training. Which means this could be the best trampoline to buy for your gymnastics students or for home use if you’re serious about your sport. 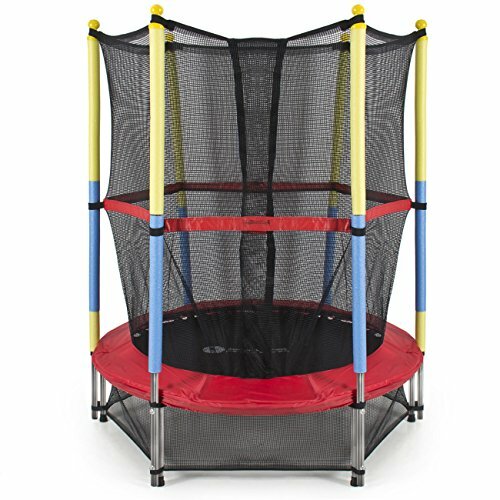 It offers the highest lift compared to round trampolines due to its extra long, rust-resistant springs which provide excellent support and bounce for jumpers to exercise more control over their jumping height and landing. With an array of quality safety features, having fun on this rectangle trampoline is always safe. 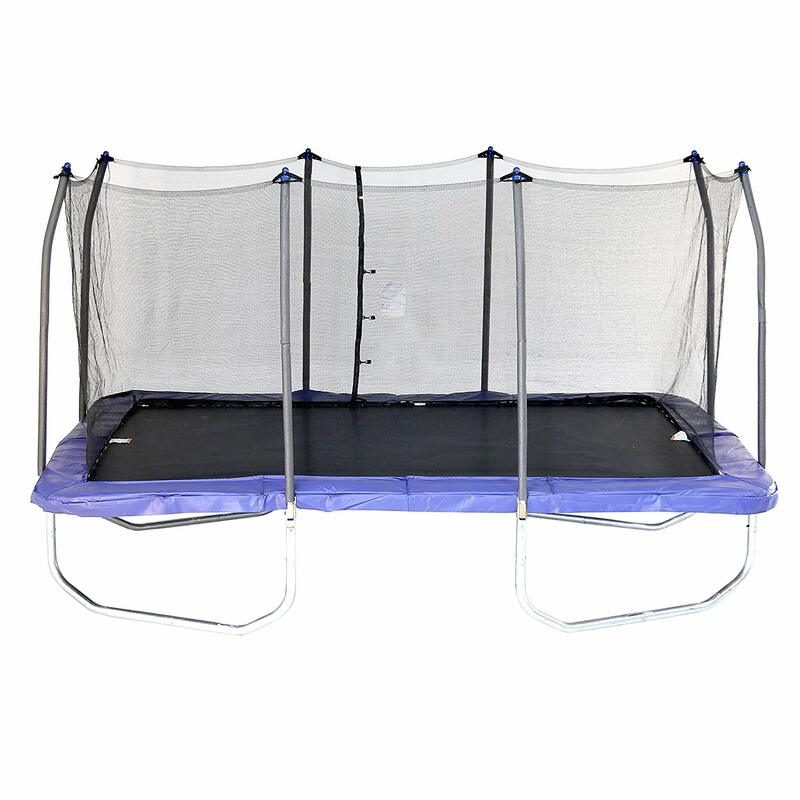 Its sturdy galvanized steel frame and weather-resistant materials are long-lasting for many years of jumping fun. The enclosure frame is interlocked with the trampoline frame by solid T-sockets at every joint, minimizing the possibility of structural twisting and maximizing safety for your kiddos. Most importantly, there are no dangerous gaps between the enclosure net and jump mat as they’re attached to each other via a patented no-gap enclosure system. This minimizes the risk of tiny toes and fingers getting trapped. Its dual net enclosure system also keeps the kids safe by preventing them from accidentally falling off the jumping surface. 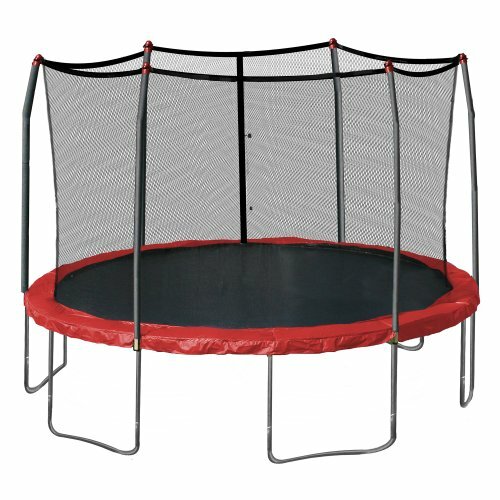 Definitely a fantastic rectangle trampoline that’s very popular with parents who want the best trampoline for their kids. However, the 15 ft Skywalker Rectangle Trampoline with enclosure is not without its flaws. According to some users, some springs are already loose after only 2 weeks of use and the padding started to fade after less than a year outdoors. Not so great as a trampoline for outdoor use.